Click the 'View this item online' link above to view this What's On session slide presentation: Older, fitter, stronger. Physiotherapist Libby Oldfield outlines the steps we can take, beginning right now, to improve our health and fitness into the future. Recorded at Counterpart Resource Centre, Melbourne, on 25 February 2019. Please note: Library items can only be posted within Victoria, Australia. We will contact you for your mailing details. Do you have advanced/metastatic cancer? 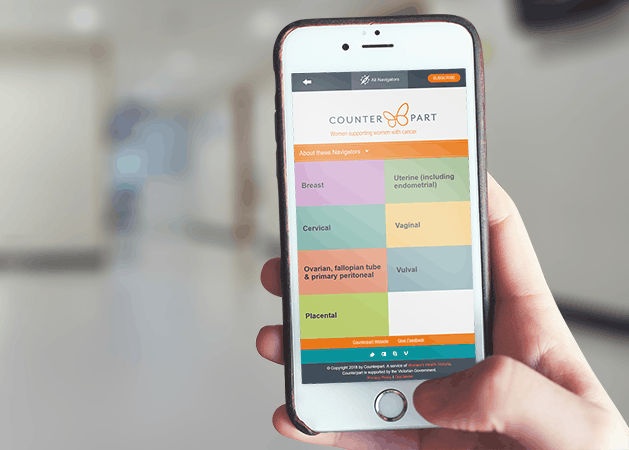 Counterpart offers a program of events called ‘Making Connections’, specifically for women living with an advanced cancer. Would you like to receive information about this program? Find out about our Navigators for online links to information on a range of breast and gynaecological cancer related topics. Still can’t find what you are looking for? Then just call us on 1300 781 500 or send us an email for help. The Resource Centre is open Monday, Wednesday and Thursday, from 10am to 5pm.